I have all the graphs working except network and memory. Memory just gives me a Paging option. Is this normal? Traffic for the network card is a dead image. I seem to have an inverse issues to some that I've read - I get the thumbnails generated for queues/transfers, but not the actual graphs. It was working fine on an Ubuntu 12.04 and 0.8.7something version of cacti. Upgraded to 14.04 and 0.8.8b and this is happening. The datasources update, the thumbnails are accurate, but the actual graphs never get created. I tried on another ubuntu box, fresh install of 14.04 and 0.8.8b. Exact same behavior. Other metrics are fine, only queues/transfers does this. An update, graph debug actually shows the graph. They're simply not being created in the output directory (graphs directory under webroot). Other graphs work fine, thumbnails for these missing graphs are fine. I have deployed a new Ubuntu 14.04 Cacti Server running 0.8.8c and have not been able to duplicate this issue. Seems as when I have seen something similar to this previously it was a permissions issue on the RRD's in the RRA folder. The RRAs update fine, I wonder if it could be a combo of 14.04 and 0.8.8b? I had this issue on an upgraded server (12.04 with 0.8.7i upgraded to 14.04 with 0.8.8b from repos). Worked fine before, had this issue after. So I built a fresh 14.04 and installed from repos (again, 0.8.8b as that's what Ubuntu has) and it experiences the same issue. I'll try throwing in 0.8.8c to see if that resolves things. In the meantime, I threw cacti from Ubuntu repos onto a 12.04 box and these same graphs work like a champ (though I had to find an older version, which was in this thread). OK have a similar issue to what others have reported with the XML's though not uniformed in nature, i.e. some work some don't. EDIT: Also just to make sure it wasn't a corruption issue, I hashed the git hub version off the net (https://raw.githubusercontent.com/mrles ... memory.xml) against the local version both synced AND in the cacti/resources folder, all three identical hashes. 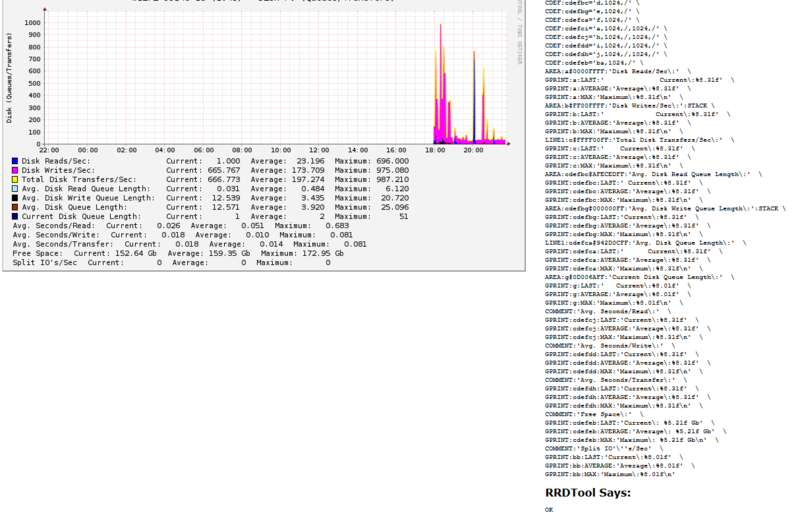 the length of the field turns out more snmp_index described in the table and the graphics are not built. I rummaged all Internet, but did not find the solution to this problem. Really nobody faced? Maybe there is some nice solution for this problem? I've tried to follow the instructions to get this working as well. Installed SNMP on Win7; this is working fine. Downloaded Informant templates v13,12,11,10,9 etc.. I know it's been a year since I posted to this thread, but it's a renewed subject for me. To expand upon my previous issues, I only have missing graph files (thumbnails are good) when using the export function. I turned on verbose logging, and it showed as successful. The only way I can make it actually work is to give www-data a valid shell, su to it, and run the graph generation command manually. Doing so via cron creates only the thumbnails. I am new on cacti. please,somebody could tell me what unit is used for laft numbers on Y-axis in this grafic ,like Kbps or anything else..
Is it possible with SNMP-INFORMANT to graph a Windows NIC Team interface? are there any news to get the template correctly imported into the latest 0.8.8 cacti version? Get the XML parse error, too. Dylan: It works though not sure it does with the free version.